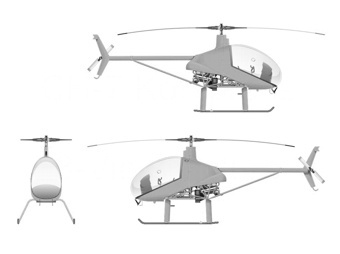 Description The CH7 ultra-light helicopter line has been developed by the Italian company HeliSport. It all started in 1980 when the firm bought the Cicaré CH6 helicopter rights from the Argentine designer, Augusto Cicaré. HeliSport developed the design into the single-seater CH7, and in 1992 this model was launched under the name of CH7 Angel. Right from the start, all of the CH7 models were constructed using a fibreglass fuselage, and the machines are all easily recognizable by their long transparent canopy, which also gives the pilot an excellent view of the outside. When the Angel turned out to be a commercial success, the model was changed into a two-seater tandem configuration by stretching the cabin and using a more powerful engine. This model was introduced to the market as the CH7 Kompress. The latest model is the CH7 Charlie, which is the successor to the Kompress in the never-ending evolutionary development process. The machines are sold in kit form only. The CH7 ultra-light helicopter line has been developed by the Italian company HeliSport. It all started in 1980 when the firm bought the Cicaré CH6 helicopter rights from the Argentine designer, Augusto Cicaré. HeliSport developed the design into the single-seater CH7, and in 1992 this model was launched under the name of CH7 Angel. Right from the start, all of the CH7 models were constructed using a fibreglass fuselage, and the machines are all easily recognizable by their long transparent canopy, which also gives the pilot an excellent view of the outside. Do you want to comment the HeliSport CH7 Kompress helicopter?